Gaze through this large arched terrace surrounded by massive marble pillars onto the lush Italian countryside. 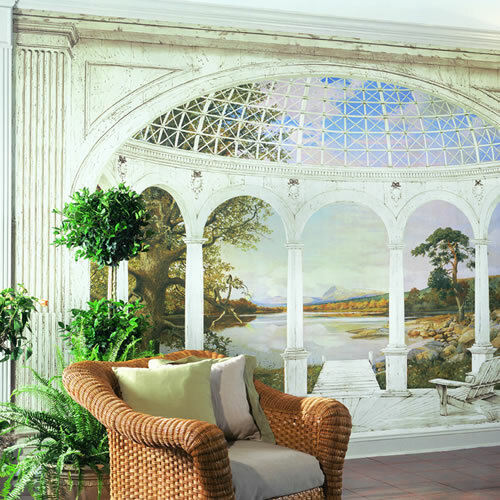 Inspired by Roman architecture, this artist rendition wall mural will add a touch of class to your home or office. Made of "Surestrip" pre-pasted material. A revolutionary natural and synthetic fiber that is stronger, easier to install, and easier to remove than any other wallpaper. Commercial class 1 fire rated. Just roll it out, wet it and apply it to your walls. When you are ready to redecorate, it comes off in seconds and in full strips, with no wall damage and no tools needed! Used by the world's most renowned designers, these artistically crafted wall murals will add a touch of class to any decor.